Videodrome is also a startlingly personal film. At least James Woods is aware of this fact if not Cronenberg. Woods' performance as Max Renn, president of the low-rated Civic TV is patterned after the director to an extent. At one point, while trying on some glasses, the sinewy Woods even resembles the bespectacled director. But while Cronenberg stands a healthy distance away from his often times perverse subject matter—the venereal deterioration of man as a result of the misapplication of science—Renn seems to actively seek involvement in it, ostensibly to spike the ratings but in reality, looking to give his own lonely, humdrum life a jolt. The wet, warm-hued hallucinations Renn experiences after exposing himself to a pirated transmission of Videodrome are at once fully capable of engulfing him even as their repulsive quality serves to keep both Cronenberg and the viewer distant enough to observe Renn's story with some objectivity. This objectivity yields a storyline which is often muddled (and not deliberately, given the film's sloppy genesis, as some of Criterion's behind-the-scenes featurettes bear out). Cronenberg competently overcomes this by framing the confusion as a result of Renn's increasing dementia. Stunning imagery such as a stomach slit in which Renn is able to insert a videotape, a gun, even his hand, is complemented by Woods incredulous expression, the reaction of a man who knows what he experiences is weird, but doesn't realize he's in a dream which he can wake from. And perhaps he can't. The intertwining or reality with unreality is such that one wonders at which point Videodrome descends into Renn's unhinged dreams or whether most of what one sees is just one of Cronenberg's alternate realities where organizations with names like the Cathode Ray Mission are as common as The Brood's Institute of Psychoplasmics. Real or not, Videodrome has proven prescient enough that the film's vast right-wing conspiracy seeking to use television to eliminate those viewers not in sync with its prescription for society echoes another right-wing cable channel popular today. Personages such as Barry Convex and Brian O'Blivion duke it out for the hearts and minds of the North American public and find their corresponding figures in Bill O'Reilly and Keith Olbermann (Glenn Beck is closer to Bixby Snyder in Robocop, who"'ll buy that for a dollar"), each ramping up the rhetoric in an effort to wear down the viewer to a point where acquiescence is easier than critical questioning of their motives. Even Renn—now revealed as representative of Cronenberg's fear of becoming corrupted by the dark ideas he traffics in—soon surrenders his mind to the manipulations, or programming, of one side against the other, a pawn in the battle between O'Blivion and Convex. 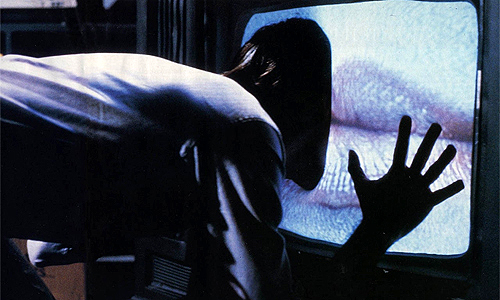 Ultimately, Videodrome's tropes would resonate throughout Cronenberg's work, reflected in the jumbled mindscapes of the protagonists in Naked Lunch and Spider, the (d)evolving body of Brundlefly, and the fetishism of Crash and eXistenZ. Flawed as it is, Videodrome is essential to understanding Cronenberg's filmography. Excellent review - but that final comment implies that up until last week, you didn't understand Cronenberg's filmography! I do find it kind of amazing that it took you this long to actually watch it (I saw it with a bunch of buddies at a drive-in theater in early 1983, when it first opened and we had no idea what we were in for.) Still - don't sell yourself short! I think you've offered plenty of great insight into his work before today. :) But now you can better appreciate how appalling it's been for me over these past nearly 30 years as I've seen Videodrome's prophecies relentlessly proving true in the real world culture we inhabit. I'm still wondering how vital it is for me to upgrade to blu-ray on this one. I like the old DVD with all the same supplements just fine, but will probably double dip eventually. I wouldn't go as far to say I didn't understand Cronenberg's biography. Let's just say VIDEODROME is even more illuminating in terms of the man himself and his particular proclivities for certain subject matter than most of his other movies. In re: VIDEODROME'S prophecies, it is a bit astonishing how prescient the film is. The upgrade to Blu would be something you prioritize according to a) how fond you are of the film, or b) the degree to which you must have the best quality picture. Otherwise, if you're fine with the original DVD, I concur that it can wait since Criterion no doubt did a great job with it the first time. Great review, Tony. It's a tough call, but this is very possibly Cronenberg's best film. At the very least it is, as you say in your intro, his most representative film, in that it's the clearest expression of his concerns and aesthetics. Thanks for your comment, Ed. I still have to warm up to VIDEODROME a bit before deciding whether it is really his best. The third act seemed to get a bit confusing in some of the wrong ways. But if we're judging strictly on promoting the Cronenbergian aesthetic, I'll give you that. My own personal favorites would probably be THE BROOD or DEAD RINGERS. This is easily my favourite film in the Cronenberg oeuvre. The special effects get to me every time, even though they do look a bit fake. That must be credit to the movie's capacity at slowly dragging me into its story. Hypnotic really. Long live the new flesh! Uh... I mean, merry Christmas!